Wooden flooring is an excellent material to install on top of any underfloor heating system due to its warm feel and excellent thermal properties. Unfortunately it is not uncommon for people to suffer problems with their new wood flooring and underfloor heating. As long as some basic guidelines are followed these problems are completely unnecessary. We have put together this article to help people considering installing wood flooring onto their underfloor heating to avoid future issues. 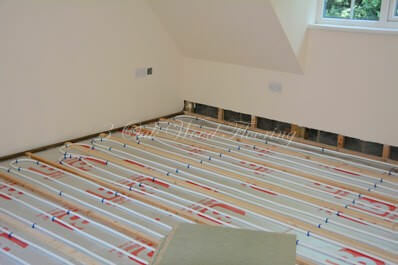 In a perfect world the UFH system should always be left on even if at a very low temperature. Wood is a living material even after it is cut down, kiln dried and processed. The cellular structure will always react to its local environment and if you are kind to your floor it will be kind to you. Think of it like paper, paper is made from wood and when it gets wet it goes soggy, you can dry it out again but it will never have the same characteristics as it had before. The key thing to remember is if you turn off the UFH system, the boards will get cold. If left for a long period in a humid summer the wood floor will pick up moisture from the air. When the heating is turned back on when the weather gets colder, the environment the wood is in changes dramatically, this can cause stress within the board leading to problems from excess movement to bowing or warping. Below is a breakdown of what we have found to be the most common causes and most likely effects of problems associated with wood flooring and underfloor heating. Getting the Underfloor heating and wood flooring installed by professionals is key to the successful combination of you heating and flooring. They have the experience to ensure the fitting is correct and can advise on any questions you may have. Buying the cheapest engineered wood flooring you can find does not necessarily mean you are getting the best value for money. Not all wood flooring is created equal, you are much more likely to suffer future problems that will more than nullify the initial saving you made buying cheaper flooring. Saving money on adhesive is also a mistake, it is really important to use a flexible adhesive that was specifically designed for use in conjunction with underfloor heating. Buying 50 tubes of Gripfill from B&Q will prove to be a false economy. Hot spots in your underfloor heating are one of your worst enemies. Hot spots can occur for a number of reasons, incorrect fitting, not enough reflector plates or insufficient or uneven screed thickness. 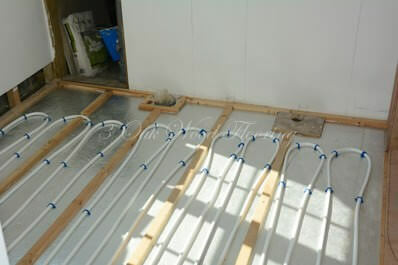 A correctly fitted UFH system should not have any Hot spots so it pays to have the system fitted by a specialist. Excessive, unnecessary changes in temperature can lead to problems. 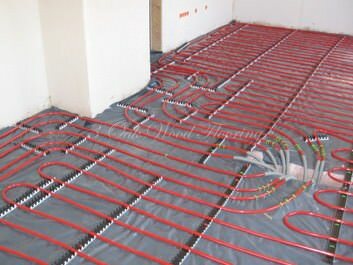 Turning your underfloor heating system off completely for long periods is not advisable as is going from a very low temperature to a high temperature too quickly. If you need to do this, be sure to make gradual increases, perhaps a few degrees a day, allowing the wood to acclimatise and balance its moisture content slowly. The same applies to decreasing temperature. Last but not least, always clean the wood flooring with the appropriate recommended cleaning products in accordance with the manufacturer’s instructions. Following the guidelines correctly should ensure you don’t have any water or cleaning in fluid penetrating between floorboards, once fluid gets down between boards the likelihood of problems will increase. Following these simple guidelines will stop the most common issues from occurring.